The rain in Haiti is intense. You can’t rightly call it “sheeting,” as there’s no visible gap between any of the “sheets.” As we make our transition through the armed checkpoints that divide the Dominican Republic and Haiti, our first picture of Haiti is a land in deluge. It’s April the 27th, the middle of the rainy season, and as we cross from the paved highways of the Dominican to the dirt roads of Haiti, we pass broken gutters rushing with garbage, and naked children bathing in the runoff. One of our team members (a well-travelled epidemiologist) exclaims, “this is the picture of Haiti that I’ve always had in my mind, of little children playing in the rain.” The rain is a regular presence for us on our trip, and it will become a difficult symbol to interpret, simultaneously watering crops and bathing children while it aggravates ground water contamination in a community without latrines. Our initial impressions of the FH team in Belladere are quite positive. We’re met at the border by the team coordinator, Jean-Marie. His sincerity and passion for his mission are immediately apparent, as is his excitement to receive visitors. He tells us that his region only sees about three team visits in a year, and the days when the teams arrive are his favourite. Our preconceived notions – or at least my pre-conceived notions - of international relief work are shattered as we meet the rest of the Belladere team. Every member is a Haitian national, and well trained in their respective fields. Nurses, engineers, agricultural specialists, accountants, and translators are all able to passionately explain how their specialties affect change in this, their home country. It’s a powerful testimony to the model of relational change from within. The fruits of this approach are readily apparent. We witness community gardens overflowing with seedlings under the stewardship of local agricultural leaders taught by the FH specialists. Cabbage, carrot, tomato, pepper, leek, okra, plantain, and yam are all managed in nurseries and distributed to household gardens, meeting starving people’s prayers for daily bread. Our team is impressed by this work, but also troubled by the handful of communities that still struggle with the implementation steps. We see these changing minds in the community savings group that we visit, one of 19 in the region. Over 30 members of local villages, almost all women, meet to pool their resources and lend to one another. We hear testimony of successful business startups and educations funded through these micro-lending groups. It was apparent that these incredible women were doing it, making their world better themselves. It was apparent until we asked how we might pray for them. The staggering response of “we have Jesus; he will take care of rest,” reminded us that these women were not doing it alone at all. Our team spends much of the trip visiting the children and communities that our church family sponsors. To their credit, the FH staff are able to find almost all of our sponsored children. We’re met in front of houses smaller than most Canadian garden sheds by children dressed in their finest to meet their “god parents.” The children are naturally shy at first as we show them pictures of our families, postcards of the Canadian Rocky Mountains, and exchange words of greeting from our own children. They’re shy, that is, until we start kicking soccer balls around with them. 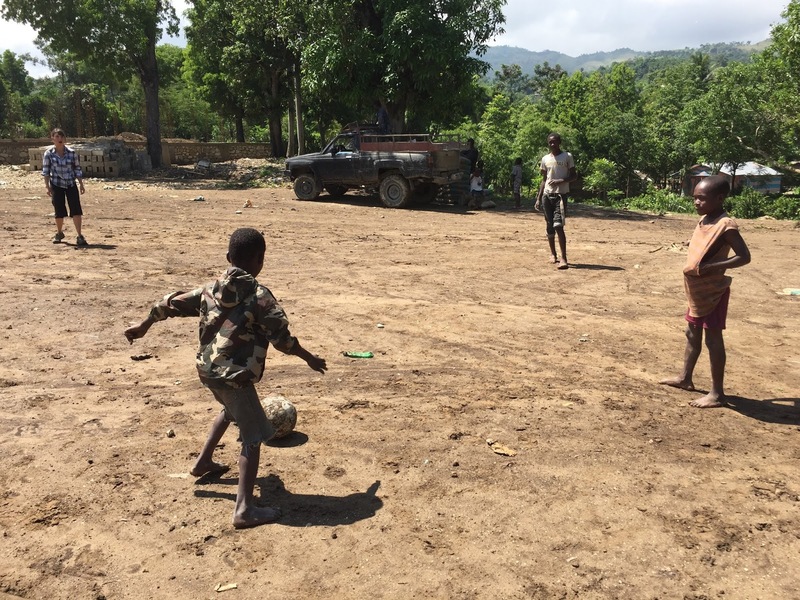 We then recognize that these children are just like our own: they come alive in play. They scream with delight as they easily outmaneuver their visitors, and we laugh at the absurdity as we fall flat in the mud trying to defend against our fleet footed attackers. 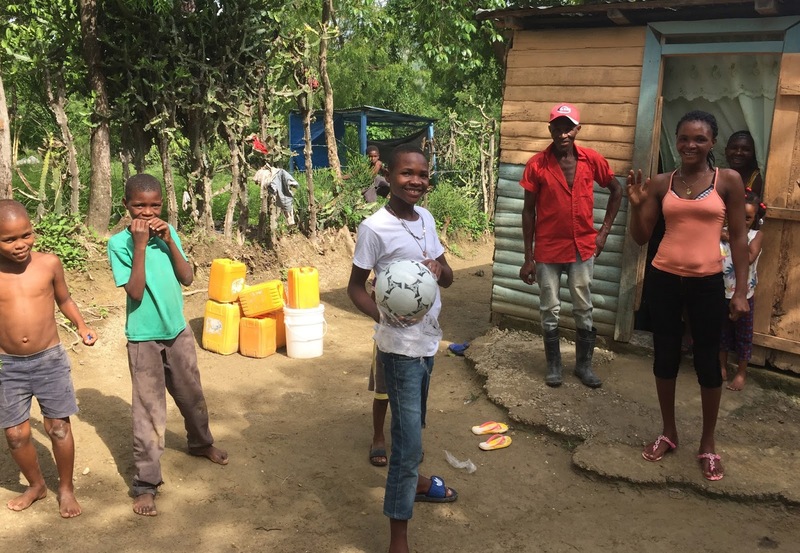 Our soccer games with the kids are some of the only afternoons without the Haitian deluge raining down on us, making roads impassable and banana-leaf thatched roofs leak into the bedding of tiny homes. Despite our busy schedule in Haiti, our team is left with much time to reflect. Mornings of prayer are book-ended by evening sessions sitting on the terrace of the house in Belladere, staring at an endless night sky, the yelping of dogs punctuating the drumming rain on the building’s tin roof as we run through the various encounters from the day and prepare for our eventual return to Canada. We appreciate this time to talk as a team: to bond and take stock. And we take stock of much. 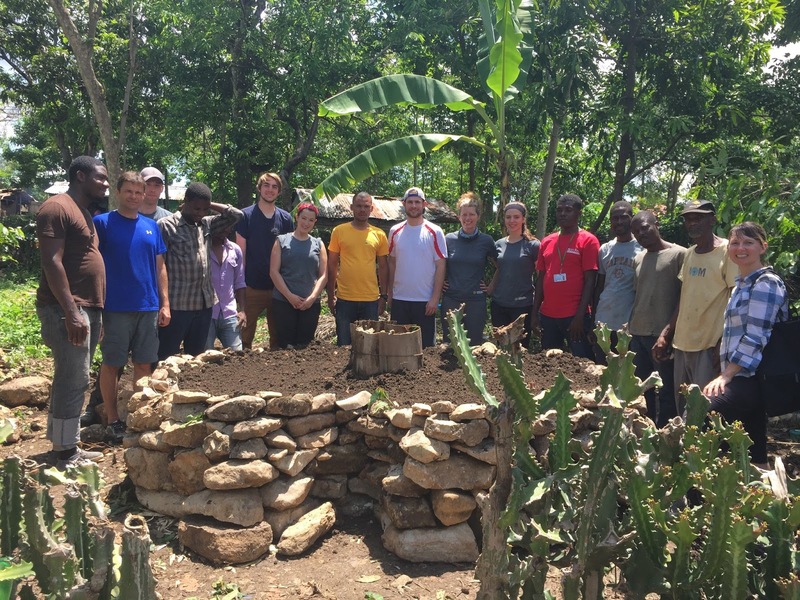 We leave Haiti feeling thankful and uplifted by the immense work of FH in Belladere. We see the needs of people being met, and we’re thankful to have borne witness. At the same time, we’re also humbled by Jean-Marie’s interpretation of our visit, “These people are so thankful that you have travelled so far just to be with them, to talk with them, to play with them. It helps them to feel human.” It seems ludicrous to us that people could be so affected by our visit. It seems insane, but this is an insane world that has left half of a tiny island (a tiny island so close to unimaginable wealth) struggling to meet their most basic of needs. It was amazing to see a group of people working to meet these needs as they walk out Deuteronomy 15:7, "If anyone is poor among your fellow Israelites in any of the towns of the land the Lord your God is giving you, do not be hardhearted or tightfisted toward them. [NIV]." We’re awed by such a sane approach to fighting insanity. My personal experience is punctuated by my flight home. The long hours on the plane afford me the time to capstone my trip by reading “Mountains Beyond Mountains,” a book written by Tracy Kidder about a physician named Paul Farmer. 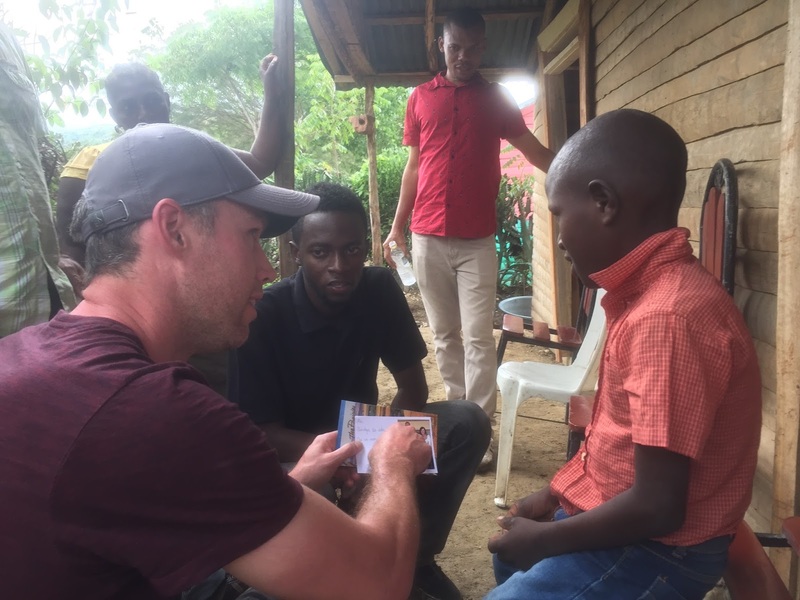 Dr. Farmer spends his life working in Cange, a community close to where our team stayed during our visit. I’m moved by a quote of his: “You want to see where Christ crucified abides today? Go to where the poor are suffering and fighting back, and that’s where he is.” There is great struggle, and great tension still at play in Haiti. Where great needs are met, many more go unfilled. Where heavy rains soaked bedding and chilled huddled families, they also grew crops and bathed tiny bodies. 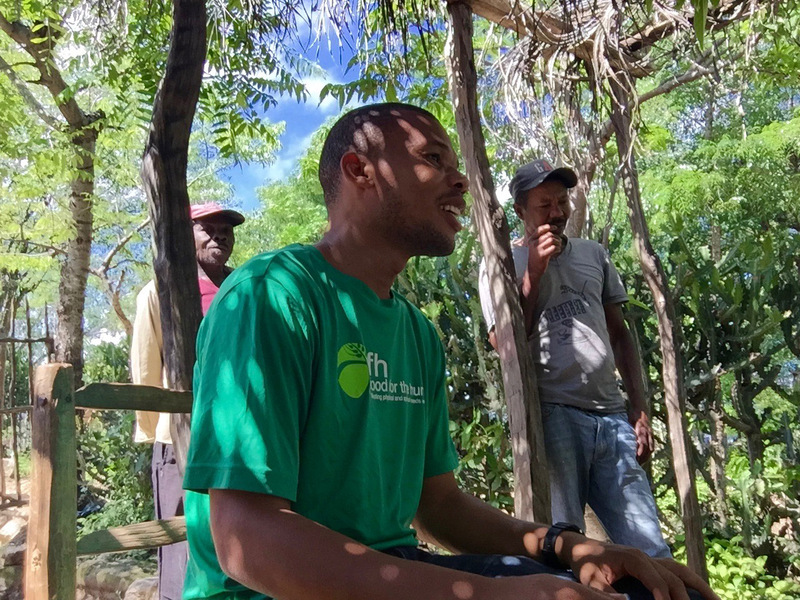 While this struggle is hard, it was uplifting to know that organizations like FH, people like Jean-Marie and his incredible team, and even visitors like us are willing to fight it, not alone at all, but with Christ crucified. Matt lives in Sherwood Park, Alberta where he works as a firefighter and paramedic. He is a father to four boys: Judah, Caleb, Gabriel, and Seth; and has been married to the love of his life, Melissa, for 15 years. The Chaffee family attends St. John the Evangelist Anglican Church in Edmonton. The Chaffees have been sponsoring a child in Haiti for the past three years, and have begun sponsoring a second child since the trip in April. Judah and Caleb, the two oldest boys, are proud to be the primary correspondents.